I’ve long been a fan of Beaumont winery whose rustic old cellar, Compagnes Drift Farm, was an outpost of the Dutch East India Company. It’s located where the N2 motorway from Cape Town descends from the plateau that starts at Sir Lowry’s post, where the R43 peels off towards Hermanus. 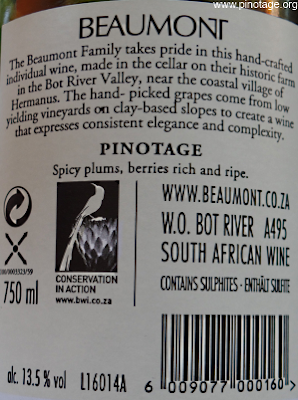 Their first wine, in 1994, was Pinotage. They’ve added many more wines since and were the first in the Cape to release a varietal Mourvedre. The winemaker is Sebastian Beaumont whose parents bought the property in 1974. 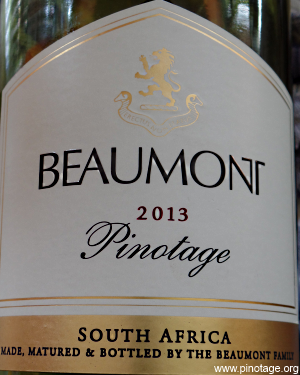 With this 2013 Pinotage Sebastian has crafted a delicate, subtle and precise interpretation of the variety. And just 13.5% abv, yet full of silky fruit flavours with a lingering aftertaste. I really like this wine. I was also pleased to see it closed with a DIAM cork.